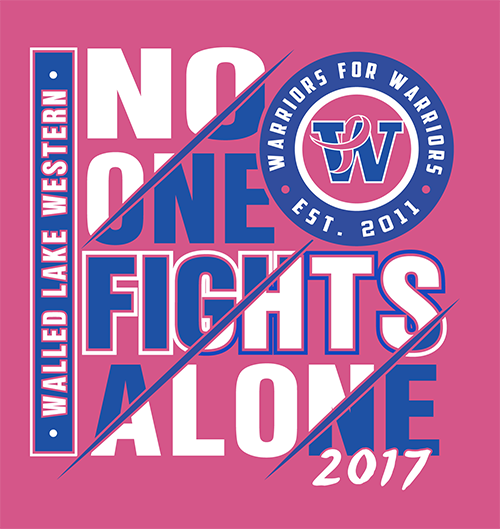 Warriors for Warriors Pink Out Jerseys are available to sponsor until September 22. Jerseys are Pink, yet we raise funds to fight all types of cancer and this event honors cancer warriors of all kinds. Sponsor a jersey and participate in the Pre-Game Ceremony where you and family/friends join us on the field as celebrity guest emcees read your special message about your Warrior … you get entry to the VIP tent with refreshments & a quieter place to sit during the the Pink Out game! 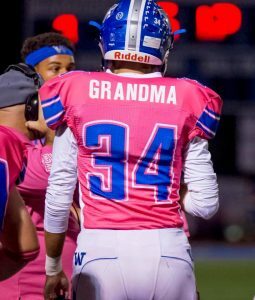 The jersey will be worn by a Walled Lake Western player during the Pink Out game and then given to you right after the game…. as a keepsake to cherish! Sponsorship also comes with two complimentary passes to the Pink Out game! Your Salon located at 46670 W. Pontiac Trail, just East of Beck Road. Pink Out Shirts are $15 and proceeds to to our charities. Wearing 2017 t-shirt to the Pink Out Game on October 13 gets you in the game for FREE!